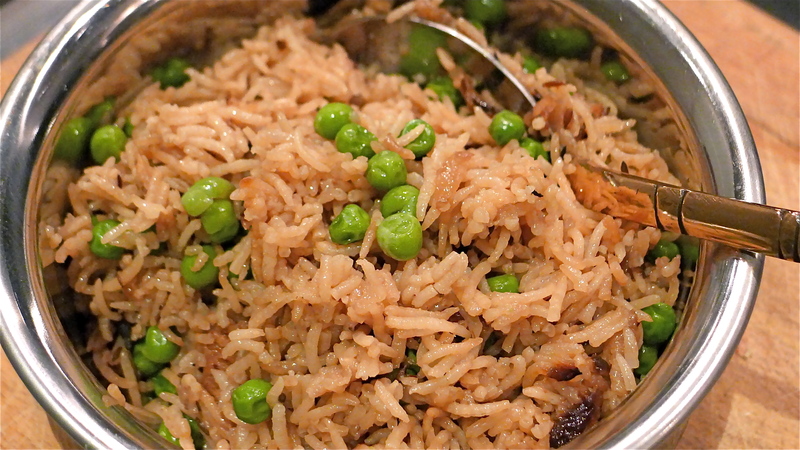 The world over, everyone loves rice and peas. Comfort food. Your mum’s is the best of course. And mine is no exception. The minute the cloves and the cardamom hit the oil, the smell transports you to the Punjab. Fragrant and gorgeous. 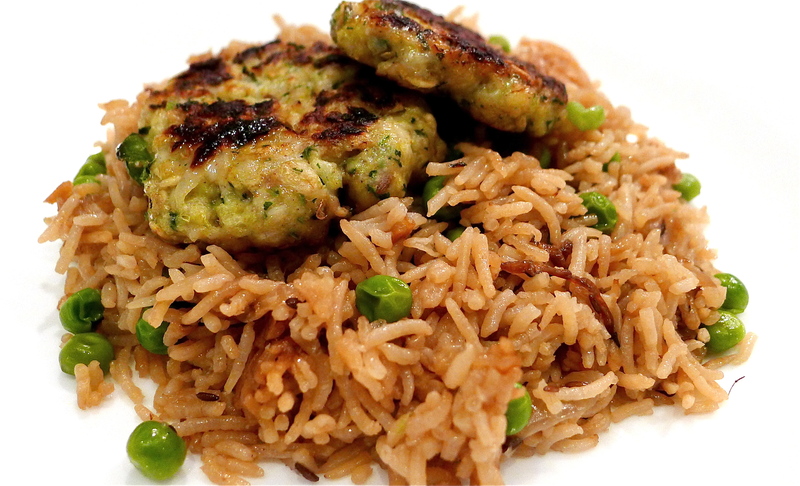 This isn’t everyday rice – it’s a bit special. A treat. Or an alternative to boring old boiled white rice. Your family and guests will be so impressed. Bathe in their admiration. Don’t tell them it’s a doddle to make. 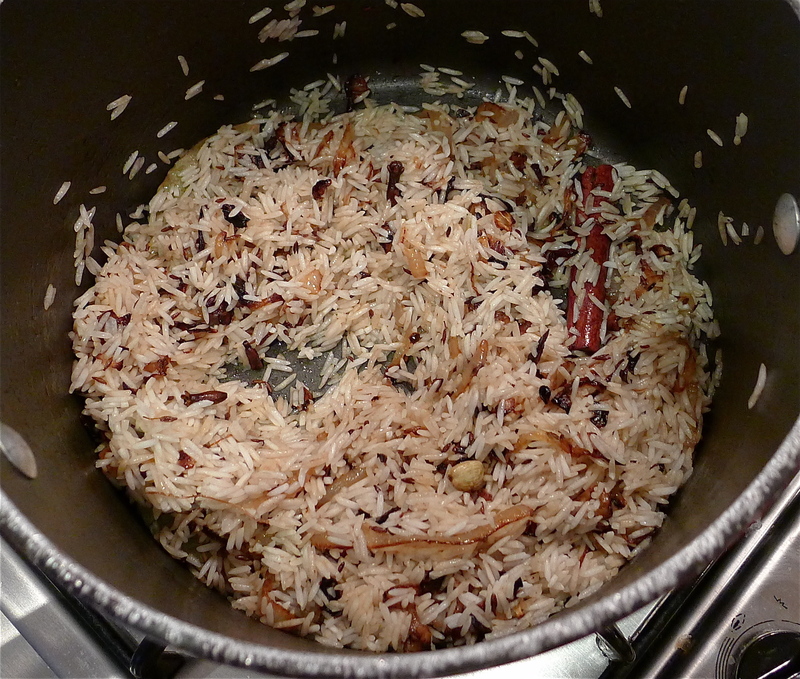 Three important things – you must keep browning the onions until they’re a dark golden brown – this is what gives the rice its lovely deep nutty brown colour. And you should always thoroughly wash your rice and, if you can, soak it for half an hour. It will be extra fat and fluffy and the grains won’t break while cooking. Thirdly, don’t keep stirring the rice once it’s simmering. You’ll make it all mushy. Hold your nerve and follow the instructions. Wash the rice throughly (in about 6 changes of cold water). Then cover with cold water and soak for at least 30 minutes. Set aside in a sieve to drain. Meanwhile heat the oil in a large pan. 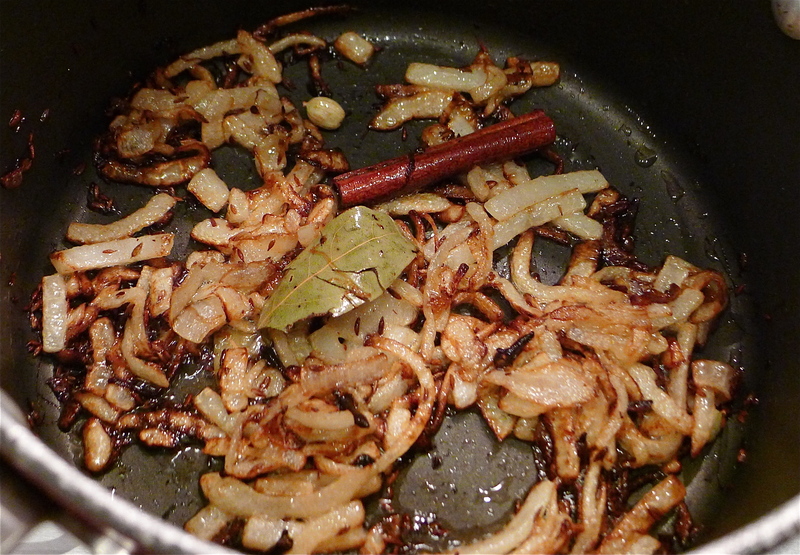 Add the cloves, cinnamon, bay leaf, cumin seeds and cardamom. Stir for a few minutes, til they release their aroma. Add the onions. Cook until deep golden-brown. Remember, the colour of your onions influences the colour of your rice. When the onions are the right colour, add the peas. Mix for a few minutes. Add the drained rice. Mix gently for about a minute until the rice takes on a mid-brown colour. Taking care, add 800 ml of water. Add 1 tsp salt. Bring the liquid to the boil. Reduce the heat to medium and cook, covered for 10 minutes. Most of the water should be gone. Stir once gently to distribute the peas. Reduce the heat to low and simmer, covered, for 10 more minutes. After 10 minutes, take off the heat but leave it to steam for another 10 minutes. Serve. Delicious with kebabs!